If your 12-year-old son was playing in the park by himself with a toy gun and you saw video of a policeman shoot him and stand over him watching him die, and you spoke out against that injustice... what would you say if someone responded by saying All Lives Matter? Alton Sterling. Shot dead by Police. Selling CDs. Caught on video. Another one. Don't bother watching the gruesome video. You've seen it before... many times. There will be more. A hi-res phone video camera is not the luxury item for black Americans that it is for other communities. Sadly, it's now a necessary tool of self defence. One of the nuances of being black in America. Stop saying "All Lives Matter." Start proving it. Be a human being and not an arrogant, judgmental catch phrase. A black man selling CDs is shot several times while lying on his back, yet white supremacist Dylan Roof guns down nine black people in a church and is captured peacefully by police. They even took him to Burger King! Twelve-year old Tamir Rice was playing in a park with a toy gun in an open carry state and was shot by police, yet three white biker gangs shot up Waco, Texas, killing nine people, injuring 20 and shooting at police, and somehow 177 of these armed men were peacefully arrested. All are currently out free and none have gone to trial. Freddie Gray had his spine partially severed and his larynx crushed, according to the lawyer his family hired, and died a week later after having not received prompt medical attention. A police report claimed he miraculously shattered his own spine and crushed his own larynx. No one has explained how a man with a crushed larynx and spine walked so normally out of the police van into his cell, answering all the obligatory questions without a single police officer noticing as he died over the course of days with no medical attention. None of the six police offers charged in the death of Freddie Gray have gone to jail for this. Sandra Bland earned two university degrees and was heading to a job at a university when she was pulled over by police. She was found dead in her cell three days later. The officer responsible was indicted for perjury and was fired, but no one has gone to jail for this. A Guardian study reveals that in the U.S., one in 65 deaths of young black males is caused by being shot by police. 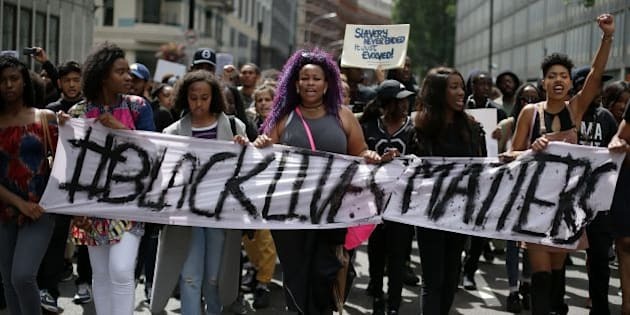 In 2015, 41 per cent of people killed by police were black, despite making up only 20 per cent of the population in the cities the shootings occurred. And before someone brings it up, police deaths are thankfully at their lowest number since Reagan was president, but deaths by police this year are at a record high. When black people facing this type of brutality, which has gone on for centuries, speak out in protest, they're told to be patient. To be respectful, and told where and when they can protest... and how. People who I never see post a single comment asking how the hell in 2016 the leading cause of death of young black males can be getting killed by police have tons to say to disparage the people who bring up this issue and demand change. Why can't you ask, "What if that was my child/father/brother/sister/friend?" Why is it so hard to have empathy for a 12-year-old black kid playing in a park, or a woman with two degrees going for her first big job? Or a poor young black man who's hustling selling CDs to look after his family, instead of begging on the streets? What ever happened to empathy? Be a human being. I'm tired of wasting time and energy arguing with people who are more concerned with their convenience and comfort than with the fact that black Americans are standing in a pool of their own blood. I'm tired of explaining right and wrong to people who should have learned it in kindergarten. I'm tired of people, who in the words of Martin Luther King, "... are more devoted to 'order' than to justice; who prefers a negative peace which is the absence of tension to a positive peace which is the presence of justice; who constantly says 'I agree with you in the goal you seek, but I can't agree with your methods of direct action;' who paternalistically feels he can set the timetable for another man's freedom..."
Stop saying All Lives Matter until it's true. By the way -- I'll save you some time. We will learn every sordid detail of this latest victim's life to justify why he deserved to die. There will be marching for two weeks, with counter-marching from the growing All Lives Matter movement, maybe even sprinkled in with a KKK presence and armed white supremacist "Patriot groups." The policemen will be exonerated by a carefully manipulated grand jury. And quietly, a year from now, Alton Sterling and Philando Castile's families will be paid $5 to $6.5 million (the going rate of these settlements, it seems) in taxpayers money in a civil settlement by the city while "not admitting any wrongdoing." It's now a cost of doing business built into police budgets. It's normal.